Share May 8, 2014 • http://chrp.at/1poN • Share on Facebook • Tweet This! Bronze Radio Return, Hey Monea! Share April 30, 2014 • http://chrp.at/1qie • Share on Facebook • Tweet This! Share April 23, 2014 • http://chrp.at/1pXc • Share on Facebook • Tweet This! Share April 2, 2014 • http://chrp.at/1puy • Share on Facebook • Tweet This! Share March 26, 2014 • http://chrp.at/1pfn • Share on Facebook • Tweet This! Share March 19, 2014 • http://chrp.at/1qc7 • Share on Facebook • Tweet This! Share March 12, 2014 • http://chrp.at/1q2N • Share on Facebook • Tweet This! Rachel Woodall writesYour Official Lineup for “D.C. 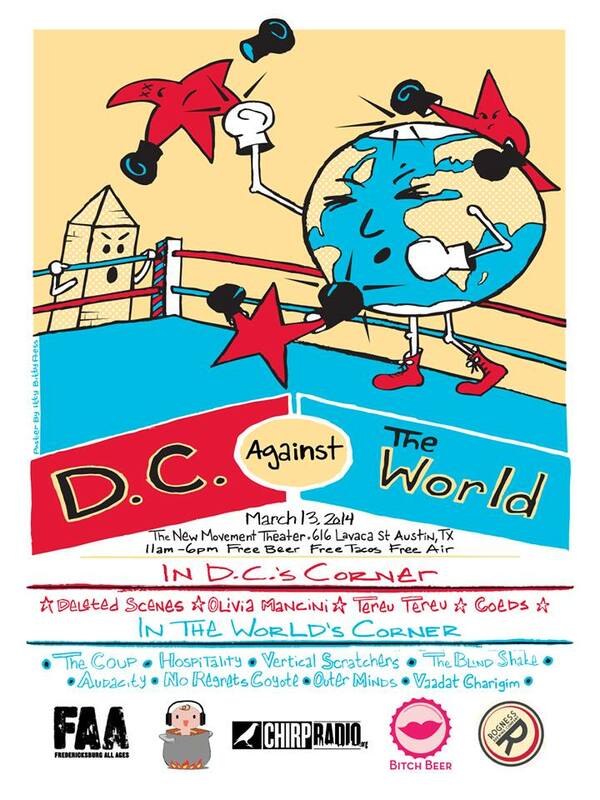 Against the World” at SXSW on March 13th! 11:25am-11:55am Olivia Mancini :: On team DC is the lovely and multi-talented Olivia Mancini. Mancini is a singer-songwriter who masterfully combines folk-pop, doo-wop, and rock ’n’ roll sounds into one upbeat and lively package. 12:20pm-12:55pm Audacity :: All the way from California, Audicaty is a quartet of true garage band rockers. Together since the ninth grade, these musicians have stuck together and stayed true to their guitar-driven, high energy, garage band feel. 1:30pm-2:00pm Outer Minds :: From CHIRP’s hometown of Chicago comes the band Outer Minds. They skillfully combine big garage band, pop, and psychedelic riffs together to create a unique sound. 2:35pm-3:10pm Blind Shake :: Out of Minnesota comes the dynamic power trio Blind Shake. Their unique sound comes in part from the use of a baritone guitar instead of a typical bass.The three put on an electrifying punk rock show. 3:45pm-4:20pm Deleted Scenes :: Another in the Team DC camp, Deleted Scenes bring a unique and unmatched genre to the show: art-rock. Using sound from dozens of genres—including punk, avant-garde, ambient electronic, and pop— the trio has a strong and memorable sound to go with thoughtful lyrics. 4:55pm-5:40pm The Coup :: From Oakland, California, The Coup describes themselves as playing “funk, punk, agressive-disco” music, alongside the description “political hip hop.” Their unique sound and thought-provoking lyrics will leave an audiencedancing…and thinking. 11:55am-12:25pm Vaadat Charigim :: Vaadat Charigim is an Israeli trio who consider their music both dream pop rockand conceptual art. It will be all about the tight, ambient and interestingly laced guitar sounds for most listeners, as the band sings all in Hebrew. The trio gives a breathtaking and thought-provoking performance. 12:55pm-1:30pm Vertical Scratchers :: Vertical Scratchers is a musical duo out of sunny California. Although the band is small in size, they are anything but small when it comes to soundTheir punk-pop-rock sound is extremely energetic and powerful, and the lyrics are equally so. 2:00pm-2:35pm Hospitality :: Out of Brooklyn, Hospitality is a pop-rock trio with an edge. Frontwoman Amber Papini’s smooth vocals blend well with intricate guitar solos and tight drums. This band packs a punch, but their sound is just lighthearted enough to get you bobbing your head along with them. 3:10pm-3:45pm No Regrets Coyote :: This band takes punk rock back to it’s roots. Not only do they give a great performance, leaving you ready to party, but their guitar riffs and catchy hooks prove they have great musical talent behind those just-wanna-party attitudes. 4:20pm-4:55pm Tereu Tereu :: Another for team DC! Tereu Tereu is an indie duo with a strong DC post-punk influence. They are all about past and present meeting: heavy guitar hooks combined with electronic melodies from their laptops. “We all just hope to survive the digital era,” they explain. 5:40pm-6:00pm Coeds :: From Austin & NYC, Coeds is a girl/guy electro pop duo. Between Meridith Munoz’ lyrics and vocals and Ryan Kailath’s skillfully composed music, it’s no wonder the Coeds are such a joy to listen to. They will get you dancing with a lighthearted, '80s-inspired, feel good sound! Share March 7, 2014 • http://chrp.at/1qeI • Share on Facebook • Tweet This! Share March 5, 2014 • http://chrp.at/1ptA • Share on Facebook • Tweet This! Share February 26, 2014 • http://chrp.at/1pKH • Share on Facebook • Tweet This! Share February 19, 2014 • http://chrp.at/1pnQ • Share on Facebook • Tweet This! Share February 12, 2014 • http://chrp.at/1q9U • Share on Facebook • Tweet This! Jessica Nikolich writesCatch Dream Pop Duo Weeknight at Empty Bottle on Thursday, February 13! Andy Simmons and Holly MacGibbon (who prefer to be surname-less) are the faces behind Weeknight, a dark and synth-heavy pop outfit out of New York. 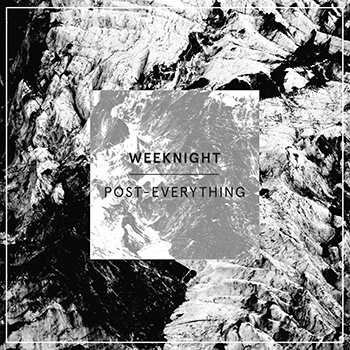 Crushing the Bushwick and Williamsburg scenes since 2011, they'll be releasing full-length debut Post-Everything on Artificial Records in March to follow in the footsteps of EP Dark Dark Lights. First single "Dark Light" showcases Andy and Holly's signature dreamy vocals sung in unison over heavy bass lines. Be sure to tune in to Vocalo.org at 4:00 p.m. the day of the show for an in-studio interview with Weeknight! Also, Chicago new wave-punk rockers Population return to the Empty Bottle, and Caden Moore will help kick off the night with YouTube and vinyl samples in his electronic project Lake Radio. Music starts at 8:30 p.m. at Empty Bottle (1035 N. Western Avenue, Chicago, IL 60622; 773-276-3600)! Share February 11, 2014 • http://chrp.at/1qcV • Share on Facebook • Tweet This! Share February 5, 2014 • http://chrp.at/1pYE • Share on Facebook • Tweet This! Share January 29, 2014 • http://chrp.at/1pWs • Share on Facebook • Tweet This! Share January 15, 2014 • http://chrp.at/1pL3 • Share on Facebook • Tweet This! Share January 10, 2014 • http://chrp.at/1q9- • Share on Facebook • Tweet This! Share January 1, 2014 • http://chrp.at/1qbX • Share on Facebook • Tweet This! Share December 19, 2013 • http://chrp.at/1pOz • Share on Facebook • Tweet This! Share November 28, 2013 • http://chrp.at/1pQl • Share on Facebook • Tweet This!